It looks like Uncle Herman is at it again. It's bad enough that the Mainstream Media likes to lump us together and stereotype us as a people, but when you have someone who looks like you doing the same thing that's worse. 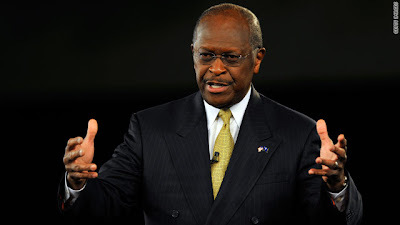 GOP Presidential candidate, Herman Cain, was on CNN's 'Situation Room with Wolf Blitzer' when he decided to share with the world his justification of why black folks tend not to support conservatives and conservative ideas. It's not because we are informed voters and just vote for our own self interest. No honey, that wasn't his answer. His reasoning for why blacks are loyal so loyal to Democrats is because we are 'brainwashed'. Herman Cain suggested that members of the African American community "have been brainwashed into not being open-minded, not even considering a conservative point of view." I guess the same can be said for Hispanics and the majority of the people that live in New York and California. I guess we're all just brainwashed. Cause heaven forbid if we actually were thinking for ourselves what that would do to the justification someone like Herman Cain feeds to himself as to why people who look like him are not for him. Maybe making blanket statements about said people could be one of the reasons.